Are your teens looking for something fun to do, perhaps something out of the ordinary? Are your teen girls spending all of their time walking around the mall or in front of the screen? Well, we've interviewed (and teen-tested) these ideas for some out-of-the-box ideas to keep your teen busy this summer and any time s/he has some extra, disposable time on hand. 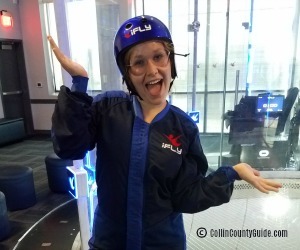 Even though our teens have lived in Collin County for over three years, they had no idea most of these options were available to them! That's when we knew we just HAD to share this with you. Because a budget is always a consideration when looking for something for teens to do, we've tried to select the value-priced options even if there are similar opportunities at higher prices. Well, it's free to visit, but if you bring home a new four-legged family member, it'll cost you a little more. For the teens who love animals, and even for those who are just very fond of them, this is a great way to get them out of the house and the shopping mall. Plan your visit when it isn't very busy and the staff may even let you take a puppy into the visiting room to play. From a piece of jewelry (under $5) to an $80 platter, this could be a great place to go for teens on all budgets. You can even bring in your own piece to paint. Our teen girls had a blast creating friendship bracelets here which, in the end, cost them about $8 each. They were thrilled with the price and their projects, especially the flexibility they had to create their own designs. 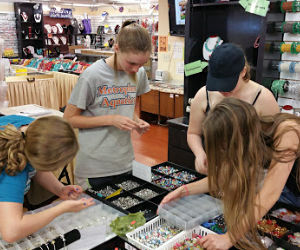 A best-kept secret is that on Saturday mornings for just $4.99 you can sit at their project table and make a piece to take home from their assortment of beads and findings. What Teen doesn't Love Bowling? While bowling in the area is about $20/hour, teens can score some pretty good deals here that brings the rate way down--and may even combine bowling with other fun activities, such as laser tag. The rock climbing wall is 24 feet high and 18 feet wide. The sandstone-textured wall challenges climbers of all skill levels. Teens Love to Laugh - Comedy Clubs! When we mentioned this option to our teens, they were VERY excited! CLEAN comedy held every other Saturday evening at Life Central Church. Improv comedy with a whole group of performers make up scenes and play games on the spot based on the audience suggestions. Your teens can come home and share the jokes with you, because if any of the performers go beyond the boundaries of good taste, they'll receive the "Potty-Mouth Foul" and have a toilet seat placed over their head! CLEAN comedy at the Night of Improv about once a month. When we mentioned this option to our teens, they were VERY excited! Dash's Track Disc Golf Course (inside B.F. Phillips Community Park) is an 18-hole championship style disc golf course. Bring your own disc (frisbee), of course. Nine-hole disc golf course with interesting Frisbee-golf-inspired public art. Just like you see on TV, teens (and all ages!) teens can stop in (specified hours) to test their skills or join a class. This one is a little pricier, but is a great highlight for a special day. Note that in addition to the race cost there is a license fee. There is a special rate if you bring the entire church youth group. The kids can get together here for a nominal $10/year (resident) $20/year (nonresident) and use the game room, media room (complete with XBox systems and Playstation) or computer lab. The center is adjacent to the Allen Skate Park, said to be the largest in the state of Texas. There's also a BMX track and In-Line Hockey Rink. An experienced skater told us this is the track advanced skaters will love. This is an experience that may be worth the membership price so teens can visit throughout the year. With the cost of admission, visitors can "enter" a videogame (the museum) where they search for "Easter Eggs" in the various games available for play. While experiencing the history of gaming beginning with Pong, visitors work their way through the decades and can play about 80 games. (40 games are available to play at no cost in within the exhibits and a few tokens are provided with the cost of admission to play in the arcade. Additional games in the arcade are twenty-five cents. Bonus: Located inside the Frisco Discovery Center, where other fun things await teens! Cool off at the Allen Community Ice Rink on a sizzling hot day. The rates are hard to beat for any activity in town. Open skating and open hockey, or catch an open rehearsal. Days vary based on location. A little pricier than the Allen Ice Rink. Every other Saturday evening from 9-11pm is Teen Night when the lights go out, lasers are turned on, and the DJ is spinning the beats! Did we mention free pizza? Laser tag, billiards, bowling, gravity ropes (Frisco), and arcade. Laser tag here is a 2-story, but you can also run out of "ammunition." Laser tag, billiards, bowling and arcade. Laser tag here is 1-story, but you do not run out of "ammunition." Our teens absolutely loved the laser tag & bowling deal, which allowed them to play again and again for one price. Pizza was also reasonably priced at the bowling alley. Free events held in a lovely auditorium include concerts, poetry, movies and book signings. And if your teens don't like these types of events, they could check out the library's link for fun designed just for them. Opened in August 2018, located in the southeast corner of the park. Combining popular street-style skating and bowl skating features, the skate park features some of the most extensive and unique skate features in all of the Dallas-Fort Worth Metroplex. One of the largest in the state of Texas at 38,000 square feet. There's also a BMX track and In-Line Hockey Rink. An experienced skater told us this is the track advanced skaters will love. 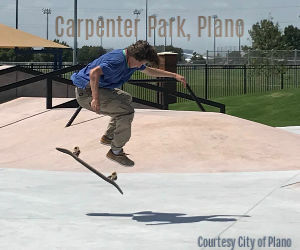 One of the largest skate parks in the state of Texas, the park has elements for all skill levels, including three bowls, street elements and roughly 30,000 square feet of concrete and shaded seating for spectators. Joel Scott Park Skate Park, which opened in 2007, is a neighborhood skate park featuring above-ground ramps. The 4800-square-foot concrete skateboard playground features quarter pipes, pyramids and banks. The skate park is located on the west side of Joel Scott Park off of Westgate Way. The park has no restrooms and limited parking and is open from dawn until dusk. The largest in North Texas at more than 47,000 square feet. Features include street and terrain course with multiple lines, rails, bowls, half pipe, and more. This is one of those activities that when suggested our teens' eyes lit up, so we've included it even though it is a pricey thing to do. Because they are in a wind tunnel, it's a pretty safe bet as long as they're healthy. Well, first of all, it's free to walk through the art gallery to browse, which is open until 5:00 most days, so you can't beat that, right? The Black Box Theater features plays, classical music, comedy and one-man shows (not free). This college theatre center features three theatres offering everything from family-friendly comedies to socially conscious dramas--and everything in between. Can you just hear the laughter as the kids work their way through crossings, up rope ladders and down the zip lines? Challenge them out of their comfort zones--or better yet, join them! It's not a cheap adventure, but they'll talk about it for a long time! This isn't cheap, but it is an adrenaline rush for the teens that just need to burn off some energy and cool off at the same time! While an inclination toward sports is a good thing going into this, there is a beginner area set apart from those who don't know what they're doing. Open year round. Do you have a church near you? All teens are welcome; they don't need to belong to the church or even share the same faith. Most churches have youth groups for all ages that provide opportunities for fun group events. Bonus: many weekly activities are free. To learn more, stop in at the church, go online, or call. Teens can hang out in the Teen Room or join one of the clubs such as anime, writers, book, or tech. The Roy & Helen Hall Library and the John & Judy Gay Library offer an area for teens to hang out and read a book. There are also organized programs at these libraries designed for teens and tweens. Haggard Library offers a Teen Digital Creation Space equipped with everything from cameras to computers for teens to have fun. Classes are offered for teens in coding & programming, college prep and digital creativity.